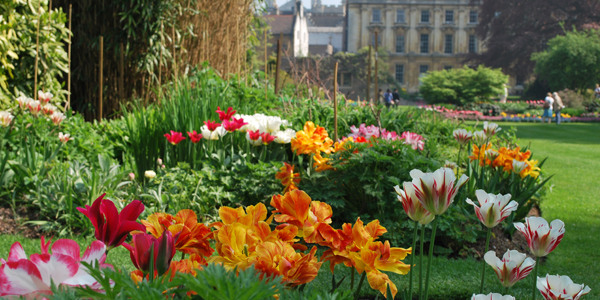 The gardens of Clare College reflect a beauty and repose which belie their position, situated as they are in the middle of the city. Sited on the ancient fenland and bounded on three of its four sides by dykes and on the fourth by the River Cam, the Fellows' garden stands as a fine example of a twentieth century English garden. Redesigned in 1947 by E N Willmer, after the devastation of the war years, the garden still retains some of its earlier features - old yews and chestnuts, a fine riverside specimen of Swamp Cypress (Taxodium distichum), a gnarled Judas Tree (Cercis siliquastrum), and an old stone wall which, together with two apple trees, once formed part of an old kitchen garden. The present design incorporates elements of formality and combines in harmony the skill and the art of both designer and gardener. At the centre of the garden, enclosed by a clipped yew hedge, lies a formal, sunken pond garden, whose low terraced walls reach a flowering peak in May. From here a path leads to the riverbank, along a traditional, double-sided herbaceous border planted in the colours of blue and yellow and resplendent at the height of summer with delphiniums, aconitum, ligularia and verbascum amonst others. Behind the old wall, which provides a backdrop for the south-facing border, lies a shady, white walk, whose trees, shrubs and herbaceous plants provide a restful contrast to the bright borders behind. Beyond the hazels and yews of the opposite border extends a spacious and informal lawn, along one side of which curves a mixed border of summer flowers and roses. Along the other is a bank planted with autumn-coloured shrubs and crowned with the last few trees of an old lime avenue. The lawn leads up to the river between two island beds containing plants of every kind. In spring these are bright with bedding displays, but the reds and golds of the autumn colour scheme, reflected by neighbouring trees and shrubs, draw the eye to the garden's eastern end at the season's close. The lawn's western side meets a long, shady walk which borders the dyke and from which a small entrance opens out into a scented garden. Here fragrant plants of all types provide a sweet perfume throughout the seasons.